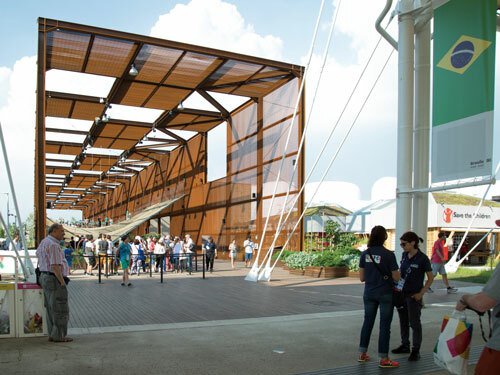 The global adoption of home-grown technological advancements in food cultivation - which has seen Brazil develop into one of the greatest agro-industrial nations in the world - was the main focus of its large 4,133m2 pavilion. Sensors installed along a lengthy corridor automatically activated media presentations, which beamed down from 25 1-chip DLP™ PT-DZ870 units set up for rear projection and hidden ceiling. Elsewhere in the pavilion, a 56.4m-long wall was brilliantly illuminated with seamless edges blended widescreen images courtesy of 22 compact PT-DZ870s fitted with ET-DLE030 ultra-short-throw lenses. A highlight of Brazil's pavilion at Expo Milano was an array of 25 super-narrow-bezel TH-47LFV5 flat-panel LCD displays installed edge-to-edge in an angled glass cabinet, with information presented in a pin sharp clarity without colour loss even when viewed off-axis - all thanks to unique LED-direct-lit IPS panel technology.